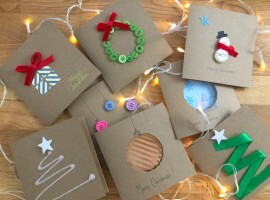 Christmas is coming and it’s time to be creative not only with the green presents, but also with home made and cheap Christmas cards to let know to our beloved how much they are important for us. 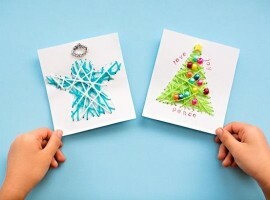 Here’s 10 simple creative ideas to create personalized Christmas cards even with the help of our children! An expensive gift offered without a card means ” I have made this purchase for you, in a hurry”. A Christmas card home made, with an eccentric paper, a funny or romantic quote, represents a sign offered with the hearth. We have collected for you 10 creative ideas to realize wonderful home made cards for your friends and beloved. You can combine the card to the sustainable and dematerialized gifts such as the Gift Card of Ecobnb that offers the experiences of green travels. What are you waiting for? Take some paper, fabrics and other second hand materials, scissors, glue and…let’s be creative together! 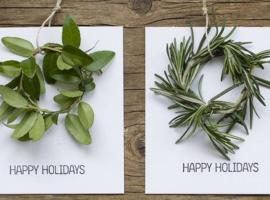 For the nature, plants and ecology lovers, here’s an excellent idea of a perfumed Christmas card. 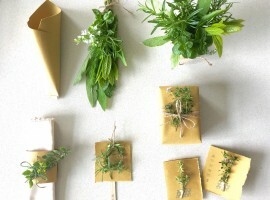 You can pick up the aromatic herbs of your garden and create with wire some small wreaths of bay tree, rosemary, sage or mint and then apply the wreaths on the card where we will write our best greetings. The idea: you can cut a leaf of bay tree and apply it on the card for a perfumed Christmas tree and then add a little star made with orange peel. 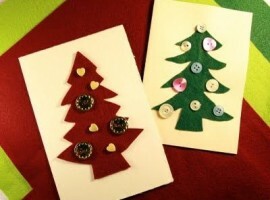 Preparing Christmas cards using the felt is very simple. 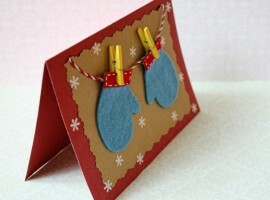 The felt is a material very simple to shape and perfect to use to create fast and wonderful Christmas cards. 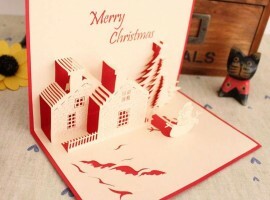 By cutting stars, hearths and Christmas tress and relying on your imagination you can create wonderful cards! Paillettes, glitters and small pearls for your fashion addicted friends. Create on the card a Christmas ball or a Christmas tree and apply some glitters, paillettes or shiny paper to create the desired shape. 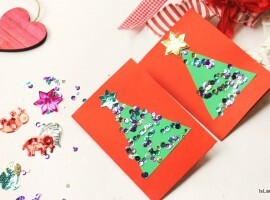 Or simply sprinkle you cards with the glitter! 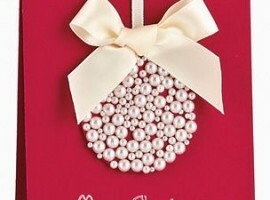 The idea: you can use wrapping silver-plated paper or shiny papers of the Eastern Eggs! 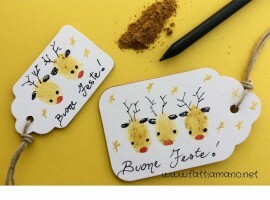 Just cut it in small pieces and apply it on the card as decoration. Cardboards, recycled paper, scissors and creativity! 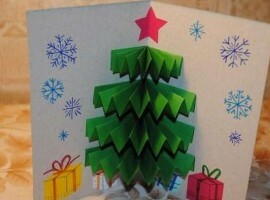 Fold the cardboard in two parts to create the base of the card. After that use the creativity and you imagination! 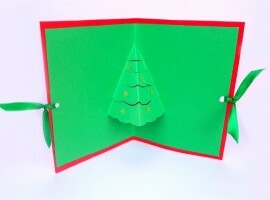 To create a card with a 3D Christmas tree you need a green cardboard, bend it until you have produced the several layers of a Christmas tree. 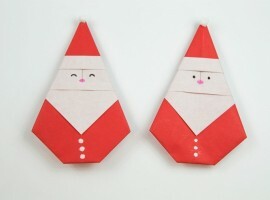 For the more expert you can also create a greeting cards using the creativity of origami! 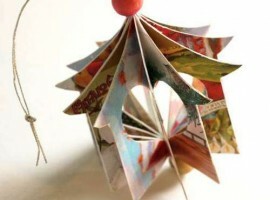 You need some wrapping card and some cardboards of different colors and imagination. Take a cardboard, fold it and cover it with the wrapping card. With the colorful cardboards you can create the Christmas characters and the Christmas decorations: reindeers, snowmen, colorful trees or a simple hearth. 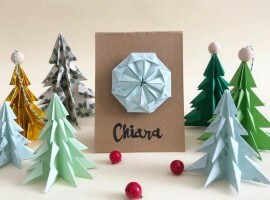 The idea: to create origami you can use the recycled wrapping Christmas card or the extra paper cuts of the wrapping card. The more colorful will be the characters, the more surprising will be the result! 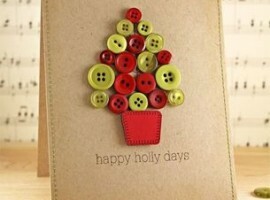 Always relating to the creative recycle, you can create greeting card by using some simple buttons. 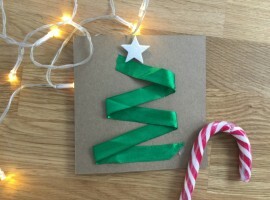 Take a cardboard and divide it, then you can decorate it with buttons and markers to create the perfect Christmas images. 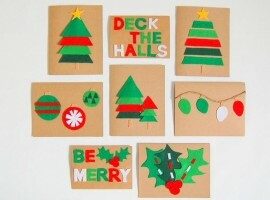 If you are using a white cardboard then use red, green and blue. Whereas if you have a colored cardboard is better to use the white or silver marker. 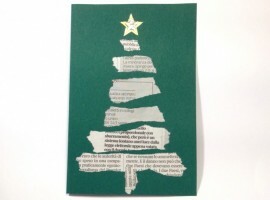 The idea: as a base of the Christmas card, it is better to use recycled paper. You may later decorate everything by adding some colored buttons, bows, paillettes or stickers. 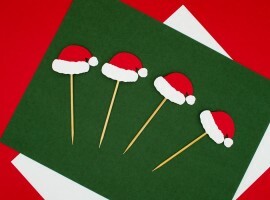 To create a creative card you are even use the toothpicks. 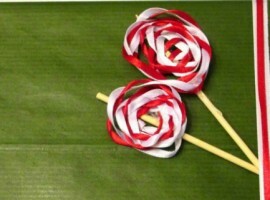 Just color with you favorite colors the toothpicks, let is dry and then, using garden scissors or a strong knife, cut the toothpicks in different shapes. Apply the toothpicks on a board card of the favorite color, starting from below to the high to create the classic pyramids shape of the Christmas tree. The idea: as a finishing touch you have to create small balls of colored papers or magazines and attached it on your Christmas tree. Fold the card in two parts. On te frontal part apply the glue and then sprinkle it with dust spices. 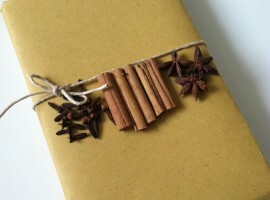 Cinnamon, nutmeg, coriander or turmeric. 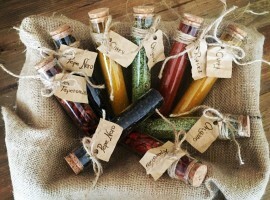 Choose your favorite perfumes. Let it dry for one hour and cover it with transparent paper. 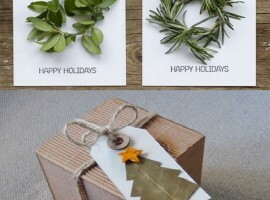 The idea: if you use the recycled paper, for a final touch for your cards, apply some cinnamon sticks or some vanilla berries. 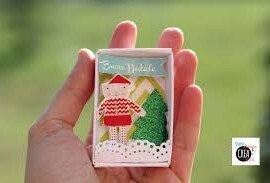 With the matchsticks boxes you can realize unusual greeting cards with a surprise effect. You need to decorate the superior part of the box with glitter, beads or simply create a cover with the old papier of newspapers or magazines and write your message on the part containing the matchsticks. The idea: to personalize your card, you can add inside some small pictures, perfumed candles, perfumed flowers, chocolate, sugared almonds or candies for a real surprise! 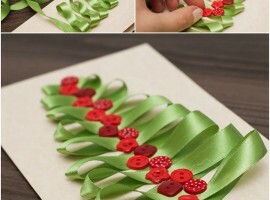 Old colored ribbons can be reused to create wonderful 3D decorations on your cards. 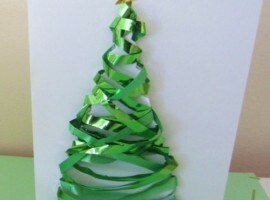 To create a Christmas tree, choose a green ribbon and apply it on the card following a triangular shape. 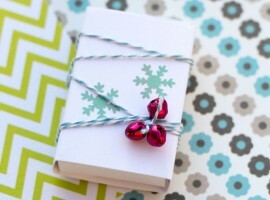 Fix the ribbon with some glue o adhesive to your Christmas card. 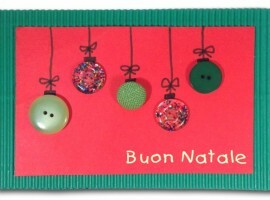 Add some colored decorations, using old buttons, piece of papers or stars. And that’s it! The idea: do you want to add your home made car with an original and ecological gift? Add a Gift Card of Ecobnb. A travel is a gift that you will always remember! The gift card of Ecobnb to offer unforgettable and authentic travel experiences in contact with the nature. This entry was posted in go green and tagged aromatic herbs, buttons, Christmas cards, felt, gift card, glitter, matchstick, origami, pop up, ribbon, spices, toothpick. Bookmark the permalink.